Saintfield High School is situated in the heart of Saintfield Village and has served successfully the area and its wider rural community for over 50 years. As a rural school, which enjoys a warm friendly community atmosphere, we share an ethos which is based upon traditional family values. Embedded within our mission statement is the aim to provide an educational experience which targets the individual excellence within all our pupils. We enrol boys and girls 11 – 16 years old and welcome those of all abilities, aptitudes and needs. P7 children can apply for a place at Saintfield High School without having to sit an entrance test. To achieve and celebrate individual excellence through effective collaboration and care, as a community focused school. When I think back to September 2014, I can clearly picture myself as I was then: my hair pinned back, my uniform all stiff and new, and my stomach filled with butterflies. I was about to enter a very important stage of my life…Year 8 at Saintfield High School. As nervous and awkward as I felt on that first morning, I soon realised there was no need to worry. 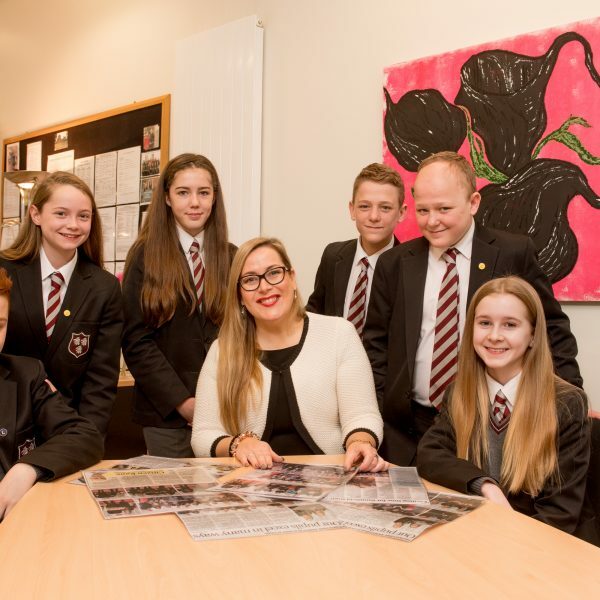 As those first weeks and months rolled by, I very quickly got used to life at Saintfield High School – I made friends, I enjoyed the lessons, and my teachers were always there to support me. If you had asked me back at the start of Year 8 what I thought my school experience would involve, I would never have guessed that I would be honoured with the title of Head Girl, studying some fascinating subjects for GCSE, and surrounded by such amazing friends. Being a pupil at Saintfield High School has allowed me to take part in all sorts of activities over the last 5 years. I have been lucky enough to go camping on a mountain whilst completing my Duke of Edinburgh award, I have represented the school in Netball and Hockey, and I have performed with the school band as a very keen trumpet player. As for the schoolwork, it has gotten more difficult every year, but at each stage the teachers have been supportive and helped me and my classmates adjust to the challenges we face. Saintfield High School has an extremely friendly and supportive atmosphere. I am so glad I chose to study at a relatively small, country school like this. Everybody really does know everybody else, and it means nobody ever feels alone. As I prepare to leave Saintfield High School at the end of this year, I can reflect on how wonderfully positive my time here has been. I hope you make the same decision I did back when I was a Primary 7 pupil – I know you won’t regret it! The night before I started Saintfield High School, I can remember feeling so nervous. I could barely sleep. A million questions about life after primary school flooded my mind: would I get lost? Would I make friends? Would the teachers be unreasonably strict? I needn’t have worried. From the very start, I was made to feel so welcome at Saintfield High School. The staff were wonderfully supportive in those first few weeks, and they have continued to be ever since. My classmates, too, were friendly and kind – I am now lucky enough to call many of them my friends. Our school’s mission statement focuses on helping pupils achieve “individual excellence”, and I really do believe this is what Saintfield High School does best. The teachers are very supportive, and work very hard to help each pupil achieve their very best, whatever that may be. So whether you are sporty or musical, shy or confident, great at Maths or a keen reader, Saintfield High School will help you become the best version of yourself. I was recently appointed to the position of Head Boy in our school, and I must admit to being a little shocked at first. I am very proud to have been given this honour, and am grateful to my teachers for choosing me for this role. I never would have thought, back when I was that shy, nervous boy making his way in to Year 8 for the first time, that I would ever become Head Boy. I know that I have Saintfield High School to thank for helping to make me the best version of myself. Now that my time at Saintfield High School is coming to an end, I am once again filled with questions about what will happen next. Whatever happens to me after I leave, though, I am certain that this school has prepared me for it.